Inspired by his Venetian roots, the Italian jewelry designer Marco Bicego creates wonderful 18 karat gold jewels decorated with colored gemstones. Each piece of jewelry is unique since the manufacture is handcrafted. The Italian craftmanship is highlighted through Marco Bicego’s creations. One of the characteristics of Marco Bicego is the brushed gold he uses which is magnificent and luminous. Africa (gold boules), Lunaria (gold leaves), Jaipur (colored stones), Paradise (delicacy and colours), Marrakech (sinuous shapes) and Confetti (timeless elegance) are marvellous collections. Ila Collection was founded by the Indian brother and sister Vikas and Ila Sodhani in 2007. They draw their inspiration from Indian culture, designs, architecture, ornaments and craftmanship. For 8 years, Ila had been designed high-end diamond jewelry with her mother and father. Regarding Vikas, he trained in Indian design houses and handmade fabrication shops during a year. Ila is a family affair through which the founders pay tribute to the Indian refinement and craftmanship. Very dedicated, they choose exquisite gemstones and create delicate jewels. The Ila jewels are creative (geometric shapes, mix of forms and gems…), refined (exquisite details) and decorated with beautiful gemstones (white sapphire, topaz…). Recognized as a leading jewelry label in the United States, her jewels are regularly in fashion magazines like Vogue, Elle and Harper’s Bazaar. Celebrities such as Angelina Jolie, Halle Berry, and Reese Witherspoon are become admirers of the brand. Recognized by her peers, Irene Neuwirth won the Town & Country Couture Design Editors’ Choice Award (2006) and was finalist for the coveted CFDA Vogue Fashion Fund (2008). Besides, she joined in 2009, the Council of Fashion Designers of America (CFDA) as member. 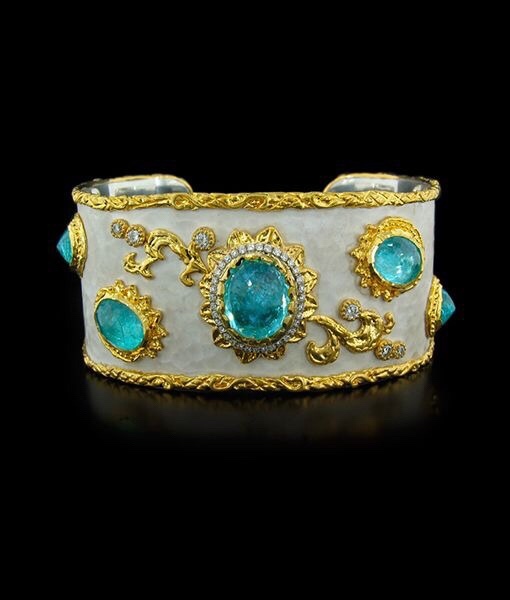 Alice Cicolini is a British jewelry designer inspired by Indian designs and using the Meenakari traditions. She had been Director Arts & Culture for the British Council in India. She used the sacred architecture and patterns of the Silk Route as an inpiration for her jewelry. All the jewels are handmade in India ; the studio of Kamal Kumar Meenakar uses the meenakari enameling traditions. The jewels are real pieces of art : patterns are engraved into 23.5 carat gold to the reverse of the jewels and colored with enamel. The jewels are decorated with gemstones. Amethyst belongs to the macrocrystalline branch of the quartz group of minerals. The amethyst’s colour varries from purple and violet to pale red-violet. Its colour comes from the iron and aluminium impurities. Furthermore, this fine gemstone is found mainly in Brazil but also “in Bolivia, Canada, India, Madagascar, Mexico, Myanmar (Burma), Namibia, Russia, Sri Lanka, United States (Arizona), Uruguay and in Zambia”. Besides, Amethyst is a symbol of sobriety : in Ancient Greece, the name amethyst meant “not drunk”. Tourmaline is an important group of complex gem-quality boron silicate minerals. This fine stone can be found in a multitude of colours : “from black to bluish-black, dark brown, yellow, medium brown, blue to neon blue, lime to dark forest green, red and reddish purple, yellow, pink, and colorless”. Most of the tourmalines are natural, not treated. However, some can be heated or irradiated to improve its colour. My favourites are pink, paraiba and watermelon tourmalines. These stones are found in “Africa, Afghanistan, Australia, Brazil, Kenya, Madagascar, Mozambique, Nigeria, Pakistan, Siberia, Sri Lanka, Tanzania, the USA, and Zimbabwe”. Furthermore, the name “tourmaline” comes from the Sinhalese term “turmali” meaning the “stone with various colours”. Besides, since Antiquity, this fine stone is reputed to bring “an unsual wealth into knowledge and spiritual forces”. According to the lithotherapy, tourmalines have positive and beneficial properties.